"Calling cadence" began (and still is) as simple as a unit leader calling out "left right left right" so that his or her unit stays in step when in formation. However, it has also evolved into a soulful, musical "sing-song" version that is fun to sing and march to, as well as more elaborate "jodies" which are generally shouted or sung in a call-and-response fashion. Wikipedia's Military Cadence page has more information and history. Cadences Make You Run Better? Some think that cadences help you run, because you are forced to inhale/exhale. Of course this is not the case: singing makes it harder to run. However, this can be a good thing, since it makes running more challenging--if you can train yourself to run quickly while singing, you will run even better when you're not singing. Surely there are some added diaphragm control benefits to boot. Plus, if one is running in a formation that includes a couple of slightly slower people, those weaker runners can occasionally "drop out" of a line or two of the jody, allowing them to catch their breath without slowing down the rest of the group. The main motivation for cadences, however, is psychological: keeping people in step, motivated, and taking their minds off physical pain. Compilations: The Cadence Page: Ryan McBeth's original site is now hosted by TopSarge, featuring a great collection of cadences from a variety of sources, along with a history of cadences. Mike Brickley's cadence page lists a bunch of Navy cadences he learned in SK "A" School and Sub School. Army Cadence, despite its name, has a good number of cadences from other services, although the site is crowded with ads. Grunt's Military has a number of cadences as well. Marine Compilations: Two great pages are, alas, only available on in archives: Brandon B's Cadence Page doesn't have anything that you won't find on other cadence pages, but several of them are "converted" to Marine cadences (e.g. "Airborne Ranger" becomes "Recon Ranger. "); Steven Jack Shiles's Cadence Page also has some good Marine cadences. Leatherneck.com's "Cadence time" discussion has a lot of good Marine Corps cadences, including "Old King Cole" changed to Chesty Puller. Finally, Marine Devil Dog has a bunch of audio files you can download for free! Booklets: Cadences and Jodies by Zak S. Blom, formerly of Ohio State AFROTC (Word file), includes some tips for how to lead cadences--a good document, although it does use Air Force terminology. There is a jodie that mentions "SCUBA diver" but somehow this is supposed to rhyme with "murky water"...hmmm.... The document also includes a definition of "cadence calls" by a certain "Drill Sgt. Timothy P. Dunnigan, US Army," who I presume is the same guy who wrote Modern Military Cadence and Running with Modern Military Cadence. I don't know anything about these books, but a related CD didn't receive very good reviews on Amazon. Similar to Blom's compilation is the California Wing Civil Air Patrol's "Jodies and Songs" booklet by LtCol Grace E. Edinboro, from San Francisco (yay SF!). It's a little bit PC (discouraging, among other things, songs "about...war") but this is less because it's from my left-leaning hometown and more because the Civil Air Patrol includes young kids. ROTC Units: Alas, most ROTC units that publish cadences are Army and Air Force ROTC. AFROTC at Valparaiso, Wright State, and MIT have some interesting jodies, including one about a "surfer dude." Alabama's AFROTC also has a few good ones ("Long Distance Daddy" is an old Marine favorite, too). Army ROTC at Villanova, University of Toledo, University of Missouri, University of Colorado at Colorado Springs all list several jodies. There are a few NJROTC pages, however, such as Henry County High School in McDonough, GA, New London High School in Connecticut and Union Pines High School in North Carolina (who copied a few cadences from this page). The only Navy ROTC (NROTC vice NJRTOTC) unit that seems to publish cadences is NROTC UNC Chapel Hill, who have a nice Running Cadence compilation (Word file). Drill Instructors: A good DI will be able to teach cadences, and may also have a library of CDs or tapes with other examples. 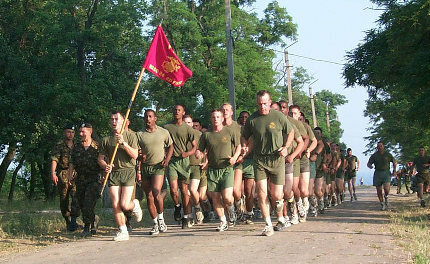 For example, my NROTC AMOI had the tape "Legends," on which GYSGT Joe L. Vines demos some excellent "sing-song" marching cadences: you can now find this on the CDs Legendary Drill Instructor Marching Cadence Volume 1 and Volume 2...although as of 2010 Amazon seems to be out so try the Sgt Grit website. After an outstanding career (read about it on Facebook) Vines retired as a Sergeant Major and is now the Commandant of the "Army and Navy Academy" in Carlsbad. YouTube: A search for "cadences" turns up a number of links. Both HazeGreyAndUnderway and SgtReap3r have a lot of Navy/Navy SEAL cadences. Retired USMC Master Sergeant scribe114 is an amateur singer, but has also uploaded recordings of himself leading cadences. Finally, Christopher Howell on ExpertVillage has a series of clips about military cadences. Forums: If you have a question about cadences that you want answered, look at Military Forum's discussion page. Left, left, lefty right layo! Left, left, lefty right-a left right! MIDN ______ won't you come on out? We wanna hear you scream and shout! [New Leader:] I've got it! [Everyone else:] S/he's got it! Said, "Hey, St. Peter I hope I ain't late"
and said "Get down Granny and knock out 10." Dedicated them to the Marine Corps! Those Navy wings are made of gold. That Air Force wings are made of lead! He wanted to be a SEAL, too! With a shark in his teeth and a gleam in his eyes. Now chief's dating Lois Lane. Now Chief's driving the Batmobile. I'm just glad that cows can't fly. Today I got a letter dated 1948.
they come back up again at nine.